The compressor in your new DSZC18 heat pump system is covered by a Lifetime Limited Warranty*. If the compressor ever fails, a new one will be provided to the original purchaser of the heat pump system as long as they live in the same single-family residence. All functional parts are covered by a 10-Year Parts Limited Warranty. * For a full description of all warranties applicable to this product, please call us. The compressor in your new DSZC16 heat pump system is covered by a Lifetime Limited Warranty*. If the compressor ever fails, a new one will be provided to the original purchaser of the heat pump system as long as they live in the same single-family residence. All functional parts are covered by a 10-Year Parts Limited Warranty. * For a full description of all warranties applicable to this product, please call us. The compressor in your new SSZ16 heat pump system is covered by a Lifetime Limited Warranty*. If the compressor ever fails, a new one will be provided to the original purchaser of the heat pump system as long as they live in the same single-family residence. All functional parts are covered by a 10-Year Parts Limited Warranty. * For a full description of all warranties applicable to this product, please call us. 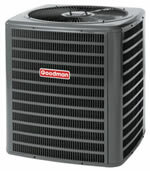 This durable heat pump system will help lower your utility bills year-round and will deliver many, many years of enhanced indoor comfort to any home. The compressor in your new SSZ14 heat pump system is covered by a Lifetime Limited Warranty*. If the compressor ever fails, a new one will be provided to the original purchaser of the heat pump system as long as they live in the same single-family residence. All functional parts are covered by a 10-Year Parts Limited Warranty. * For a full description of all warranties applicable to this product, please call us. 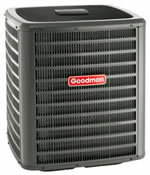 This reliable heat pump system can deliver years of comfort to your home and to your heating and cooling budget. The attractive powder-paint finish offers premium durability and improved UV protection to the exterior chassis. All functional parts, including the compressor, are covered by a 10-Year Limited Parts Warranty*. For a full description of all warranties applicable to this product, please call us. All functional parts, including the compressor, are covered by a 10-Year Parts Limited Warranty*. For a full description of all warranties applicable to this product, please call us.